This is a general overview about the Estonian tax system. For further details please follow links to original information provided in the text. Direct taxes are withheld from the salary automatically by the employer. Direct taxes are income tax, unemployment insurance and the funded pension payment. 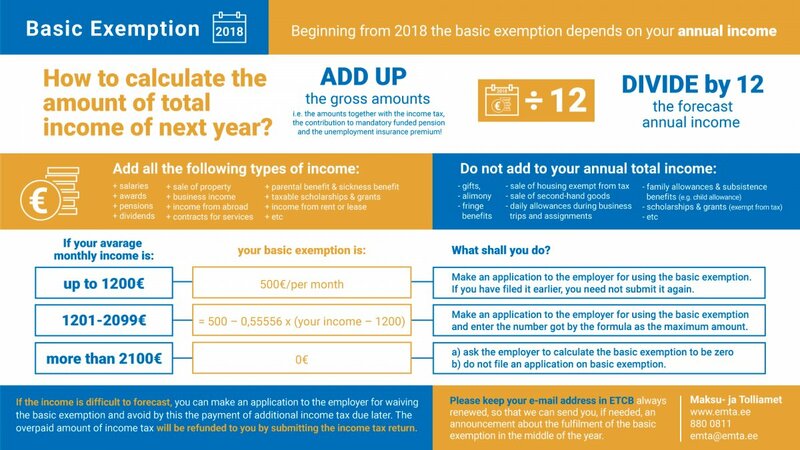 As of January 2018 the tax-free amount (basic exemption) of 500 euros per month (or 6000 euros per year) will be applied on all types of income. You must ask your employer to take the income tax free sum into account for salary payments. Income tax is not charged on compensation for official travel, accommodation and daily allowances, if these are within the limits established by the law. Basic exemption can only be calculated and applied by one employer (the withholding agent) according to a person’s application. An employee who works at several jobs shall have to take into account that he/she is entitled to use the basic exemption on one job only. Annual income 19 800 euros gives 3000 euros as basic exemption and annual income 22 500 euros gives 1500 euros as basic exemption. Information in this section is based on information provided by the Estonian Tax and Customs Board webpage about tax-free income. A monthly unemployment insurance tax of 1,6% is deducted from your salary by your employer. A funded pension payment is withheld from your salary at a rate of 2%, if you have joined the optional funded pension system. You can read more about it in the Pensions section. Social tax is paid by employers at a rate of 33% on all payments made to employees for salaried work performed. Social tax is not part of the salary number; it is calculated on the basis of the agreed (gross) salary. 13% of the social tax goes to the Health Insurance Fund and 20% goes to pension insurance. There is an extra 0,8% unemployment insurance payed by the employer, not included in the salary number. The most important of the indirect taxes is the value-added tax (VAT), which is 20% (from 1 July 2009) for most goods. The VAT for some goods, such as books, medicines etc., is 9%. There are also more indirect taxes for gambling, tobacco products and alcohol. For taxation of foreign citizens working in Estonia, it is necessary to determine their taxation residency (they are residents of which country for taxation purposes). A person should be a tax resident in only one country at a time. Estonia has agreements to avoid double taxation with many countries, incl. all EU member states. Some of these agreements have more favorable conditions for researchers or professors so check the agreement with your home country. The tax exemptions can be applied only if you have certified your residence status in another country to the Estonian tax authority. This can be done by presenting a certificate by the tax administration of your residence country to the Estonian tax authority. The form form TM3 (available on the Estonian Tax and Customs Board portal) can be presented to the Estonian tax authority for claiming application of the Convention for avoidance of double taxation for certifying your country of residence. It is not necessary to submit the document if data on you and your residency have been entered in the register of taxable persons of the Estonian tax administration. Check your status in the register here. Social security contributions (social tax, unemployment insurance and funded pension payment) will not be paid or withheld in Estonia if the employee has a ceritificate of a posted employee (Form A1) issued by the authorities of an EU country, or a country with which Estonia has a social security agreement (Canada, Ukraine). To which country should your employer pay your social security contributions? Read more about social security on our Health & Social Security in Estonia page. The most convenient way to file your income tax return is by electronic submission through the e-Tax Board, where pre-filled forms are available. Enter with your ID-card credentials, mobile ID or via Internet bank (most banks in Estonia provide this possibility). Filling in the income tax return: the fields of the tax return must be filled in Estonian irrespective of the language of environment (Estonian, Russian or English). Information on the status of the income tax return appears on your personal income tax return information page. Contact an Estonian EURAXESS Services Centre for assistance with the income tax return forms. Income tax returns must be presented by Estonian residents. An Estonian resident is someone whose permanent residence is in Estonia or who stayed in Estonia for 183 days or more during one year. There is a Form R which shall be submitted to the Estonian Tax and Customs Board for informing about changes in the natural persons residency (e.g. if you will become an Estonian resident for tax purposes upon arrival). If you leave or arrive in Estonia, we suggest you to ask help from the tax administration, in order to decide if your residency has changed (for tax purposes). A non-resident is obliged to submit a tax return if he/she has received taxable income that is subject to taxation in Estonia, but on which no income tax has been withheld upon payment. Estonian residents must also declare the income that they have received abroad. If an Estonian resident stayed abroad for work more than 183 days in 12 consecutive months and taxes were paid from the income abroad, no additional income tax has to be paid in Estonia, and the income must be declared as tax free income from abroad. If an Estonian resident stayed abroad for work less than 183 days, income tax has to be paid on the salary received abroad as well. Taxes paid abroad are taken into account, so no double taxation occurs. If the income tax in the other country is smaller than in Estonia, the difference in the income taxes must be paid in Estonia. If the income tax in the other country is higher than in Estonia, no refunds are paid for the difference in the taxation rates. who stays in Estonia for less than 183 days in a period of 12 months. The residency is decided taking into account all days physically spent in Estonia. Non-residents have a limited tax liability in Estonia, and only the Estonian-source income is taxed in Estonia. Non-residents can claim deductions and allowances available to residents if they are residents of another EU country and have received at least 75% of their income from Estonia. The tax exemptions can be applied only if you have certified your residence status in another country to the Estonian tax authority. This can be done by presenting a certificate by the tax administration of your residence country to the Estonian tax authority. The form form TM3 (available on the Estonian Tax and Customs Board portal) can be presented to the Estonian tax authority for certifying your country of residence. It is not necessary to submit the document if data on you and your residency have been entered in the register of taxable persons of the Estonian tax administration. Check your status here. If the international agreement for the avoidance of double taxation prescribes more favourable conditions for the taxation of the income of non-residents than those provided by law, the provisions of the international treaty apply. In the event that your income tax has been withheld at a higher rate than prescribed in the tax treaty, you may apply to the Estonian tax authority within three years from the deadline for the payment of the tax for a refund of the overpaid tax amount. If the income tax was withheld upon payment then you do not have to submit a tax return. You are obliged to submit a tax return if you have received taxable income that is subject to taxation in Estonia, but on which no income tax was not withheld upon payment. Before withholding income tax, the unemployment insurance premium (1.6% of gross salary) shall be deducted from the payment made made to you. In the case of social tax there are generally no differences for the taxation of residents and non-residents. For further information on taxation issues and in the event of difficulties determining your country of residency, see the website of the Estonian Tax and Customs Board or contact the ETCB directly. It is important to determine if you are an Estonian resident or non-resident for tax purposes. Residency rules can be quite complicated so please read with care. Before coming to Estonia, we advise to ask from your local tax authority a certificate proving your previous status as tax payer. This comes handy especially in case your home country has a bilateral tax treaty with Estonia and you are subject to certain benefits. It is important to remember that your status of residence (if you will become a resident of Estonia or remain a resident of another country for tax purposes) must be certified by the Estonian Tax and Customs Board. The decision will be made upon your application that you should file after arriving in Estonia. This may be done through the Form R. By the said form you may solve the problem of double residency that can arise due to different rules for the determination of residency for tax purposes in different countries. Determining the country of residence is based on a number of conditions. If the answer to these questions is yes, then you will probably be considered resident of the other contracting country, your income will be taxable only in you home country and you do not have to pay taxes in Estonia. Treaties may also prescribe other conditions for the determination of residency. To prove that prior to arriving in Estonia you have been a tax resident of the other contracting country, you need a certificate issued by your local tax authority. Even if one condition is not fulfilled – for example, if you are employed by an Estonian organisation, Estonia has the right to tax your income. Usually the employer withholds income tax according to Estonian legislation already while making payments. In case the employer does not withhold income tax, it is your obligation to declare your income. In the event that your home country does not have an effective bilateral tax treaty with Estonia, the decision concerning your residency is based upon the number of days spent (or planned to be spent) in Estonia. 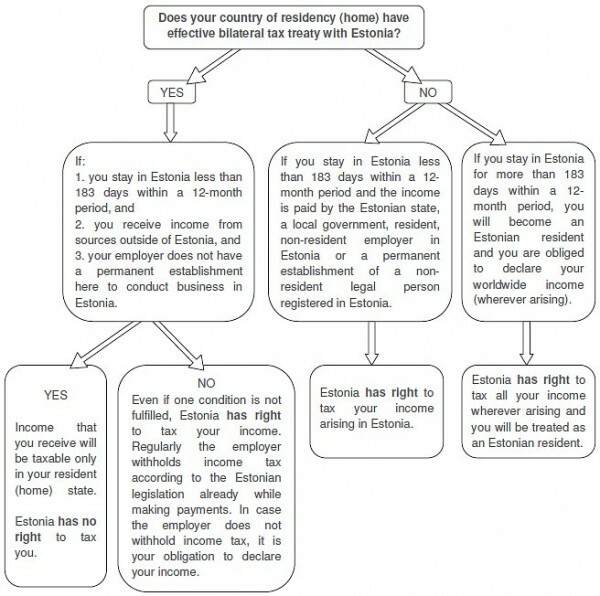 If you stay in Estonia less than 183 days within 12-month period and the income is paid by Estonian state, local government, resident, non-resident employer in Estonia or permanent establishment of non-resident legal person registered in Estonia, you are considered a non-resident of Estonia and Estonia has the right to tax your income arising from Estonia. If you stay in Estonia for more than 183 days within 12-month period you will become an Estonian resident and you are obliged to declare your worldwide income (wherever arising). Estonia has the right to tax all your income wherever arising and you will be treated as Estonian resident for tax purposes.